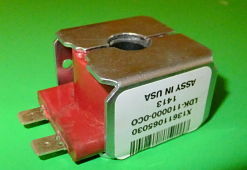 24 VAC Reversing Valve Solenoid Coil used in American Standard; Trane equipment. Technical Specifications: 24 VAC ; 50/60 Hz. Replaces Part Numbers: COL12849; COL-12849. Used in American Standard; Trane Models: 2TWB3024A1000AA and many others.